A web site of your company is not just an online brochure of your business. It's an Image. It's an image projected to the whole world. The website of your business needs a reflection of what you desire to portray to the world. This is more of a highly refined digital art-form with all the technical specification fitting perfectly into right places. The implementation of a website is a process that takes countless hours of digital artists, code experts, programmers, and database wizards to create a perfect Web - Representation of your company. Our Web team has the creative talent necessary to design user-friendly sites with fantastic visual impact, while also possessing the technical skills to build innovative, yet reliable solutions. Importantly, our Web team also has the business acumen and skills to create effective solutions, strategically tailor made to your organization's requirements. Our creative team will put the magic in your web site using the latest tools in the market. We can make a home for your Web site on the Internet. This is called "hosting" your web site. It is similar to having a street address on the World Wide Web. Once you have an address, your Web site can be viewed by virtually anyone browsing the World Wide Web. Hosting a Web site involves registering a new Internet "Domain name" (or Internet address) for you as well as setting up the space and access rights for you to build and maintain your Web site. Your business is safe with us. CIPL specializes in website promotion and online marketing. 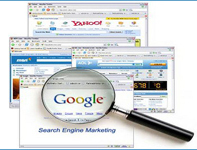 Using update techniques and methods to enhance search engine listings and online visibility, we can get you the traffic you need. 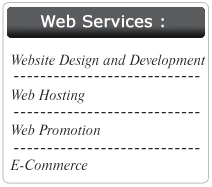 We are into E-COM since last five years, we help our clients to projects their selves on the web market. Our Solution for powerful website management consists of a Package. 3) Site Admin — the secondary, user-friendly backend component which let you administer/manage your products and inventory.